A nationally known artist whose work is represented in museums across the United States, Ann Purcell creates abstract paintings, collages, and works on paper in which she explores tensions of paradox, ambiguity, duality, and contradiction. Using an active process related to dance—an important form to her when she was growing up—Purcell brings feeling and movement into her work, drawing the viewer into an emotional engagement with it. In her art, dense shapes can lose solidity, openings can seem to close and then open again, gestures can waver between decisiveness and acquiescence, and space and form change roles. Observing Purcell’s art is like listening to music, in which the meaning is fully present in our minds, but hard to put into words. Born in 1941 in Washington, D.C. and raised in Arlington, Virginia, Purcell studied independently in San Miguel de Allende, Mexico, and received her B.A. from the Corcoran College of Art and Design and George Washington University, Washington, D.C., in 1973. She received her M.A. in Liberal Studies from New York University in 1995. Purcell first exhibited her work in 1971, when she had a solo exhibition at Villa Roma Gallery, San Miguel de Allende. 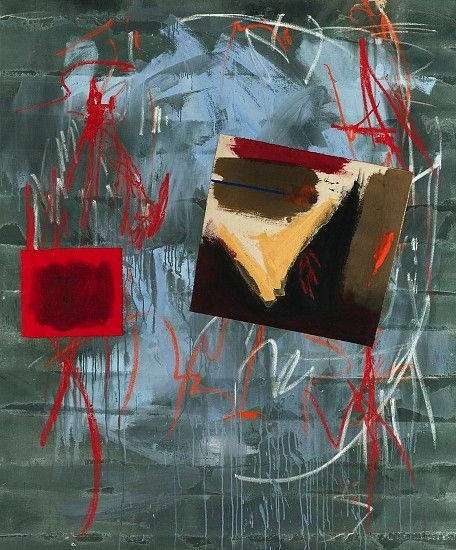 She has subsequently had numerous solo shows at prominent venues including the Corcoran Gallery of Art, Washington, D.C. and Tibor de Nagy Gallery, New York. She also took part in several notable museum group exhibitions, including shows at the Albright-Knox Art Gallery, Buffalo, New York; Corcoran Gallery of Art; and the National Museum of Women in the Arts. Purcell taught painting, drawing, and art history for many years at the Corcoran College of Art and Design; the Smithsonian Institution, Washington, D.C.; and Parsons School of Art and Design in New York. She has also been a guest lecturer and artist-in-residence at many universities. Purcell received grants from the Lester Hereward Cooke Foundation, National Gallery of Art (1988, for mid-career achievement), the Pollock-Krasner Foundation (1989), the New York Foundation for the Arts (2013), the Joan Mitchell Foundation (2014), and the Adolph and Esther Gottlieb Foundation (2014). Purcell’s work is represented in the collections of the National Gallery of Art, Washington, D.C., the Phillips Collection, Washington, D.C., the Corcoran Gallery of Art, Washington, D.C., Albright-Knox Art Gallery, Buffalo, New York; the Baltimore Museum of Art; the National Museum of Women in the Arts, Washington, D.C.; the Santa Barbara Museum; and the Virginia Museum of Fine Arts, Richmond.